Highfield ‘A’ travelled to Celtic. The Munster Select team travelled to the Sunday’s Well. Thurles travelled to Highfield ‘B’. Silver Springs had a bye. Players can now register for this years Irish Masters Open online. The Open takes place in Fitzwilliam LTC, Dublin on Friday 20th, Saturday 21st and Sunday 22nd of March. 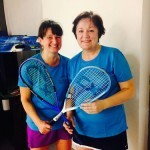 We saw some great squash as Highfield Ladies and UCC Ladies battled it out in a friendly kind of a way at the Sundays Well courts on Wednesday 25th February, with Highfield Ladies winning overall by 4 matches to 2. Celtic travelled to Tipperary to face Thurles. Battle in Highfield between the ‘A’ and ‘B’ squads. Silver Springs travelled up the Lee to face Sundays Well. Munster Select had a bye. Munster Select squad travelled to Silver Springs. Thurles travelled to Highfield ‘A’. Highfield ‘B’ travelled to Celtic. Sunday’s Well had a BYE. First match of the week was between the 2 sides from Highfield.